A lightweight and subtley textured cream, this Ginseng and Marigold after shave cream from KORRES delivers water and nutrients to the skin improving tone and firmness. With the anticeptics properties of Marigold and Witch Hazel's astringent property, skin is fully protected from irritation and redness. Skin is moisturised by the presence of Aloe and provitamin b5 whilst being soothed post shave. Just received my order, it came as per ETA, in great condition! I've been using this product for a couple of years now and have only good things to report. Firstly, you don't need to apply much and so a bottle will last you a good amount of time. Secondly, once applied it has an immediate cooling affect and it really does help prevent any post shave irritation. Thirdly, it smells great, almost like an eau de toilette - my fiancée prefers the smell of this stuff over my Chanel! I recommend anyone who suffers irritation/spots/blemishes after shaving to give this a go! 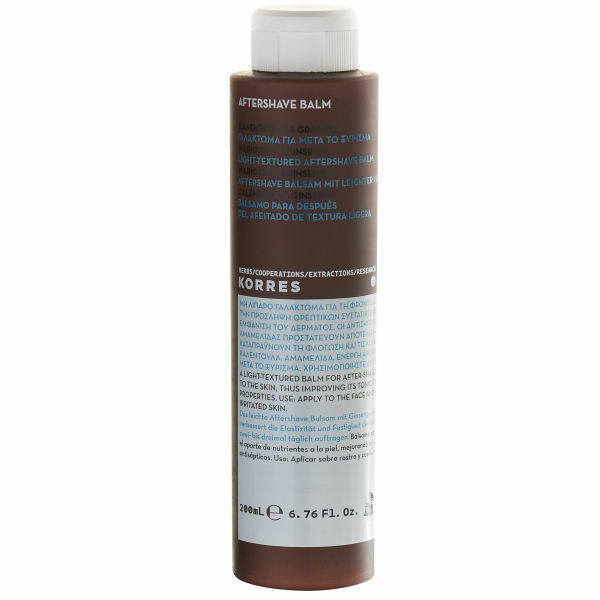 Yet again another excellent Korres product! I am consistently pleased with the quality and the value of their men's skincare range. This is advertised as an 'aftershave cream' but in fact it is useful as an all-purpose moisturiser. I use it twice a day, not just after shaving. I tend towards slightly oily skin, but this moisturiser is very light and does not leave a 'shine' like some other products. Been using this for a while now. Great aftershave product. Subtle perfume, not over powering. Keeps shaving rashes and bumps away. Also, this is a new 200ml container, so very good value from Mankind.